I FINALLY reached the end of my to do list. . .mostly. Everything is made. I still have to write my post for Saturday's blog hop but that shouldn't be too rough. NOW. . .now I get to create! With so much freedom and so many options I decided to leave it in fate's hands and started by reaching into a zip baggie of pendants on my desk. I pulled out the first item I touched. It happened to be a polymer clay pendant from Davinia at Deez News. I took the black and white theme of the pendant and ran with it. With just two bead caps left on my desk and some matching beads, I made a pair of earrings as well. After that, I decided to pick up where I had left off. . .before the challenges and hops and stuff. Where was I? 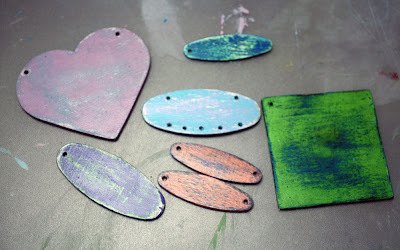 Oh yeah. . .Shabby pendants! This is not the greatest picture of the ones I made, but it's the best I could do this morning. I apologize! Now, I've got aspirations of possibly working on some of my own goals and creating a few things to send in to a magazine. . .WHAT WHAT!!?? Yeah, I need to do this before my own conscience begins to drive me crazy with it's constant chirping of "get published, get published, get published. . ." So, that's what's going on my bead table next. Oh and in addition to getting more made, I'm trying to re-stock the shop. Not because anything selling, but because stuff keeps expiring. Today, I listed this blue beauty from the One Crayon Challenge. I'm off to brainstorm. Here's hoping I don't get distracted!! I love both pieces! I'm a sucker for the black and white combo in anything! I keep reminding myself (very sternly) to get published, and suddenly I realize the deadline has already passee, and then I go into self-loathing mode. I need to find a way to just do it. What a great idea to put pendants into a bag and just reach in and grab one and create something beautiful without much thought over it. 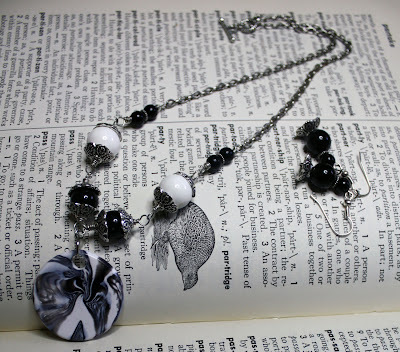 The black and white necklace you created today is gorgeous I love it, but then again I love just about everything you make. 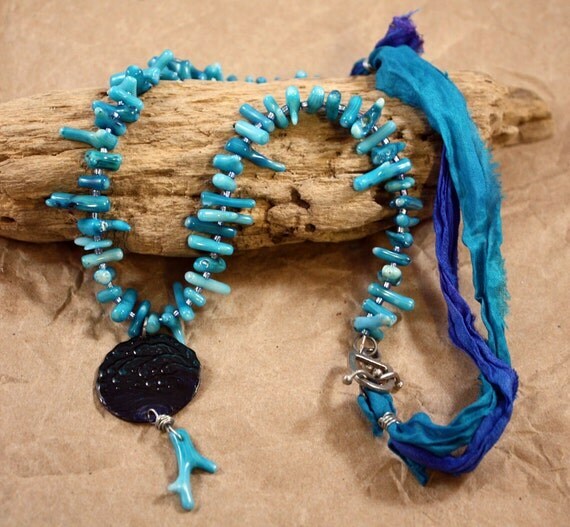 I loved your washed away necklace when I first saw it during the blog hop and I still love it the blues are so pretty in this piece. You will get published, you will get published, you will get published... 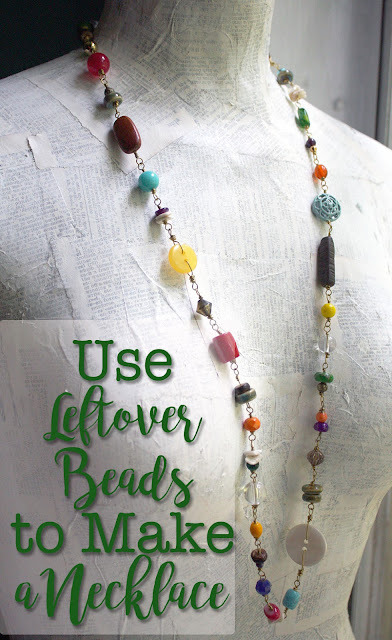 I would submit the Washed Ashore Necklace, just a thought. Rooting for you, Hope! Hoping to see your name in the magazine! And I absolutely LOVE your shabby pendants. love love love!